Ecthyma gangrenosum is a rare ulcerocutaneous infection previously thought to be solely caused by Pseudomonas aeruginosa pticaemia, often with associated neutropenia. (1) It is common in individuals with suppressed immunity of varied aetiologies, including but not limited to haematologic disorders (malignancies and bone marrow suppression); lymphoproliferative disorders; and autoimmune diseases such as rheumathoid arthritis and systemic lupus erythematosus. (2–5) Pseudomonas aeruginosa remains the most common cause of EG, but it is also known to be caused by a variety of pathogens, can occur with normal neutrophil counts, and affects both immunocompetent adults and children. (5) Although HIV/AIDS can cause profound immunosuppression, only a handful of articles report on EG in association with HIV/AIDS, and none with concomitant panophthalmitis. This article reports on a case of a woman with AIDS who developed oculocutaneous ecthyma gangrenosum with a fatal outcome. A 44-year-old woman admitted via the emergency department with a 3-month history of multiple ulcers and a 3-day history of rapidly progressive swelling and loss of vision in the right eye with associated fever. She had been diagnosed with human immunodeficiency virus (HIV)-infection 5 years previously, was placed on antiretroviral medications, but defaulted 3 months before presentation. Before her contact with our team, she had been admitted on account of multiple expanding ulcers with purulent discharge and managed as a case of pyomyositis. After a 3-week stay in the hospital, she requested discharge as some ulcers had healed, while others were improving. Her CD4 +count was 67 cells/mm3. She returned after 2 weeks on noticing the expansion of previously healing ulcers and the development of rapidly evolving new lesions. Concurrently, there was right ocular pain, swelling, and discharge, with progressively worsening visual loss. Skin lesions were located on thighs, upper limbs, buttocks, perineum, and right eyelid, often beginning as discrete painful papules or pustules, with rapid progression (within 5–7 days) to pus formation, discharge, and eventual ulceration [Figure 1] and [Figure 2]. Examination revealed multiple ulcers on the aforementioned locations in various stages of evolution. The largest on the left thigh measured 6 cm × 10 cm, had an irregular undermined edge, with slough and islands of necrotic eschar on the ulcer floor. Ophthalmologic assessment of the right eye revealed upper lid edema with mild erythema and an overlying crusted and necrotic lesion on the nasal aspect. The conjunctiva, cornea, and sclera were all necrotic. A clinical diagnosis of ecthyma gangrenosum (EG) was entertained by the dermatologists, while panophthalmitis of the right eye was the presumptive diagnosis made by the ophthalmologists. She was commenced on intravenous levofloxacin, and her right eye was eviscerated and sent for histology. Intraoperative findings were extensive scleral necrosis, melted cornea, but relatively clear vitreous. The white cell count was 4.5 × 109/L with 46% neutrophils (normal 4–11 × 109/L), while hematocrit was 20% (normal 36%–45%). Blood culture was negative; wound biopsy revealed an ulcerated epithelium with vascular congestion and areas of dermal hemorrhage and necrosis. There were also chronic inflammatory cells with features of hemorrhagic vasculitis. Culture of the specimen yielded growth of Pseudomonas aeruginosa sensitive only to cefepime, with intermediate sensitivity to ceftazidime, but resistant to levofloxacin, ciprofloxacin, and gentamicin. A concurrent definitive diagnosis of EG was eventually entertained by both dermatologists and ophthalmologists. Levofloxacin was discontinued and cefepime prescribed. The patient was, however, unable to procure the requisite medications, with a progressive deterioration in her clinical status, and eventual demise after 71 days of admission. Immunosuppressive states remain the most common risk factor for the development of EG, among which malignancies, particularly hematological malignancies, and lymphoproliferative disorders preponderate. This is clearly evident in a number of case series reported.,,, However, reports of EG in HIV/acquired immunodeficiency syndrome (AIDS) have been relatively few. The first of such was by Sangeorzan et al. who reported two patients with skin lesions caused by P. aeruginosa, one of which was EG. The following year, el Baze published a case series of 19 immunosuppressed patients with P. aeruginosa-induced dermatoses, ten of which were EG and only one was associated with HIV/AIDS. Inclusive of our index patient, there are a total of 16 reports of EG in association with HIV/AIDS to date [Table 1].,,,,,,,,,,,, In all but three cases,,, the causative agent was P. aeruginosa, and only a quarter of those with P. aeruginosa-related EG had bacteremia at time of presentation. Ninety percent of the stated CD4+ counts were ≤100 cells/ml, indicating that EG is indeed a disease of advanced HIV/AIDS. The mortality rate in this series of patients was 12.5% (inclusive of our index case) and both had widespread lesions in multiple sites in the absence of bacteremia. This is significantly lower than the mortality rate of 80% quoted by Kim et al. The fatal outcome in our patient was subsequent to the observed drug resistance to the commonly used, available, and affordable antibiotics, with eventual progression of the infection occasioned by her inability to procure the requisite, but expensive antibiotics to which the infection showed sensitivity. A high prevalence of antibiotic resistance exists in Nigeria and is responsible for the increased mortality observed in the management of communicable diseases. As stated by Greene et al., multiple EG lesions and delay in initiating the appropriate therapy are some of the factors that correlate with poorer outcome, which were present in our patient. EG remains a potentially fatal communicable disease, especially in developing countries where the dearth of reports results in a low level of awareness, a low index of suspicion, and delay in instituting the requisite therapy. Although EG may be an uncommon cutaneous manifestation of HIV/AIDS, it should be included in the differential diagnosis of ulcerative communicable disorders in advanced HIV/AIDS. Multiple lesions of EG, even without bacteremia, may be associated with increased mortality. Barker L. The clinical symptoms, bacteriologic findings and postmortem appearances in cases of infection of human beings with the bacillus pyocyaneus. JAMA 1897;29:213-6. Greene SL, Su WP, Muller SA. Ecthyma gangrenosum: Report of clinical, histopathologic, and bacteriologic aspects of eight cases. J Am Acad Dermatol 1984;11:781-7.
van den Broek PJ, van der Meer JW, Kunst MW. The pathogenesis of ecthyma gangrenosum. J Infect 1979;1:263-67. Huminer D, Siegman-Igra Y, Morduchowicz G, Pitlik SD. Ecthyma gangrenosum without bacteremia. Report of six cases and review of the literature. Arch Intern Med 1987;147:299-301. Vaiman M, Lazarovitch T, Heller L, Lotan G. Ecthyma gangrenosum and ecthyma-like lesions: Review article. Eur J Clin Microbiol Infect Dis 2015;34:633-9. Bettens S, Delaere B, Glupczynski Y, Schoevaerdts D, Swine C. Ecthyma gangrenosum in a non-neutropaenic, elderly patient: Case report and review of the literature. Acta Clin Belg 2008;63:394-7. Kim EJ, Foad M, Travers R. Ecthyma gangrenosum in an AIDS patient with normal neutrophil count. J Am Acad Dermatol 1999;41:840-1. Martínez-Longoria CA, Rosales-Solis GM, Ocampo-Garza J, Guerrero-González GA, Ocampo-Candiani J. Ecthyma gangrenosum: A report of eight cases. An Bras Dermatol 2017;92:698-700. Gençer S, Ozer S, Ege Gül A, Doǧan M, Ak O. Ecthyma gangrenosum without bacteremia in a previously healthy man: A case report. J Med Case Rep 2008;2:14. Yan W, Li W, Mu C, Wang L. Ecthyma gangrenosum and multiple nodules: Cutaneous manifestations of Pseudomonas aeruginosa sepsis in a previously healthy infant. Pediatr Dermatol 2011;28:204-5. Chuang CH, Wang YH, Chang HJ, Chen HL, Huang YC, Lin TY, et al. Shanghai fever: A distinct pseudomonas aeruginosa enteric disease. Gut 2014;63:736-43. El-Sherif NA, El-Mangush IM, EI-Dibany SA. Ecthyma gangrenosum without Pseudomonas bacteraemia in an immunocompetent healthy adult – Special issue. Int J Clin Dermatol Res 2017;S2:1-3. Cohen N, Capua T, Bilavsky E, Dias-Polak H, Levin D, Grisaru-Soen G. Ecthyma gangrenosum skin lesions in previously healthy children. Acta Paediatr 2015;104:e134-8. Vaiman M, Lasarovitch T, Heller L, Lotan G. Ecthyma gangrenosum versus ecthyma-like lesions: Should we separate these conditions? Acta Dermatovenerol Alp Pannonica Adriat 2015;24:69-72. Ivanaviciene J, Chirch L, Grant-Kels JM, Kerr PE, Finch J. Ecthyma gangrenosum secondary to methicillin-sensitive Staphylococcus aureus. Int J Womens Dermatol 2016;2:89-92. Burgner D, Eagles G, Burgess M, Procopis P, Rogers M, Muir D, et al. Disseminated invasive infection due to Metarrhizium anisopliae in an immunocompromised child. J Clin Microbiol 1998;36:1146-50. Aygencel G, Dizbay M, Sahin G. Burkholderia cepacia as a cause of ecthyma gangrenosum-like lesion. Infection 2008;36:271-3. Son YM, Na SY, Lee HY, Baek JO, Lee JR, Roh JY, et al. Ecthyma gangrenosum: A rare cutaneous manifestation caused by Stenotrophomonas maltophilia in a leukemic patient. Ann Dermatol 2009;21:389-92. Del Pozo J, García-Silva J, Almagro M, Martínez W, Nicolas R, Fonseca E, et al. Ecthyma gangrenosum-like eruption associated with Morganella morganii infection. Br J Dermatol 1998;139:520-1. Obasi OE, Osoba AO, Raddadi AA. Ecthyma gangrenosum in Saudi Arabia. Saudi Med J 2007;28:1741-4. Uludokumacı S, Balkan Iİ, Mete B, Ozaras R, Saltoǧlu N, Soysal T. Ecthyma gangrenosum-like lesions in a febrile neutropenic patient with simultaneous Pseudomonas sepsis and disseminated fusariosis. Turk J Haematol 2013;30:321-4. Sangeorzan JA, Bradley SF, Kauffman CA. 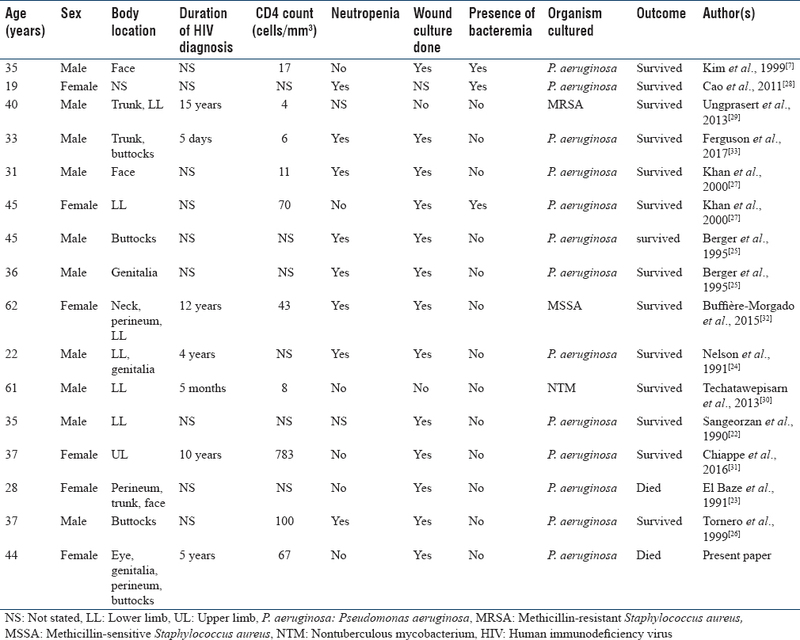 Cutaneous manifestations of pseudomonas infection in the acquired immunodeficiency syndrome. Arch Dermatol 1990;126:832-3.
el Baze P, Thyss A, Vinti H, Deville A, Dellamonica P, Ortonne JP. Astudy of nineteen immunocompromised patients with extensive skin lesions caused by Pseudomonas aeruginosa with and without bacteremia. Acta Derm Venereol 1991;71:411-5. Nelson MR, Barton SE, Langtrey JA, Gazzard BG. Ecthyma gangrenosum without bacteraemia in an HIV seropositive male. Int J STD AIDS 1991;2:295-6. Berger TG, Kaveh S, Becker D, Hoffman J. Cutaneous manifestations of Pseudomonas infections in AIDS. J Am Acad Dermatol 1995;32:279-80. Tornero C, Ricart C, Arnedo AL, Baeza R. Non-bacteremic ecthyma gangrenosum in a patient with human immunodeficiency virus infection. Rev Clin Esp 1999;199:332-3. Khan MO, Montecalvo MA, Davis I, Wormser GP. Ecthyma gangrenosum in patients with acquired immunodeficiency syndrome. Cutis 2000;66:121-3. Cao T, Combs A, Rubenstein E. Ecthyma gangrenosum in a patient with HIV/AIDS. J Am Acad Dermatol 2011;64(S1):AB101. Ungprasert P, Permpalung N, Kue-A-Pai P, Ammannagari N, Chongnarungsin D. A rare case of ecthyma gangrenosum associated with methicillin-resistant Staphylococcus aureus infection. J Infect Chemother 2013;19:761-3. Techatawepisarn T, Chiewchanvit S, Salee P, Mahanupab P, Baosoung V, Praparattanapan J. Ecthyma gangrenosum-like lesions associated with disseminated nontuberculous mycobacterial infection in an HIV-infected patient. Southeast Asian J Trop Med Public Health 2013;44:649-54. Chiappe A, Astocondor L, Chávez G, García Y, Montalvo R. Malignant otitis externa with ecthyma gangrenosum in an hiv-positive patient [Otitis externa maligna con ectima gangrenoso en un paciente con infección por VIH]. Infectio 2016;20:38-41. Buffière-Morgado A, Demongeot C, Battistella M, Taieb F, Viguier M, Rybojad M, et al. Ecthyma gangrenosum associated with infection involving a methicillin-sensitive, panton-valentine-negative strain of Staphylococcus aureus. Ann Dermatol Venereol 2015;142:262-5. Ferguson L, Chong H, Singh M. Ecthyma gangrenosum without bacteraemia: Evidence in favour of a broader definition. Clin Exp Dermatol 2017;42:324-7. Maccheron LJ, Groeneveld ER, Ohlrich SJ, Hilford DJ, Beckingsale PS. Orbital cellulitis, panophthalmitis, and ecthyma gangrenosum in an immunocompromised host with Pseudomonas septicemia. Am J Ophthalmol 2004;137:176-8. Luemsamran P, Pornpanich K, Vangveeravong S, Mekanandha P. Orbital cellulitis and endophthalmitis in Pseudomonas septicemia. Orbit 2008;27:455-7. Ghosheh FR, Kathuria SS. Bilateral periorbital ecthyma gangrenosum. Ophthalmic Plast Reconstr Surg 2006;22:492-3. Martin-Lozano G, Canivell-Zabaleta M, Torres-Carranza E, Cabrera-Perez R, Infante-Cossio P. Ecthyma gangrenosum in the eyelid. J Craniofac Surg 2017;29:531-2. Lin Q, Hu B, Shi J, Shi W, Cao W, Li L. Eyelid and periorbital ecthyma gangrenosum due to Pseudomonas aeruginosa in an infant. Pediatr Invest 2017;1:50-3. Nasir IA, Babyo A, Emeribe AU, Sani NO. Surveillance for antibiotic resistance in Nigeria: Challenges and possible solutions. Trends Med Res 2015;10:106-13.